Sermon: Oct. 28, 2018 | Trinity Lutheran Church ~ Madison, Wis. 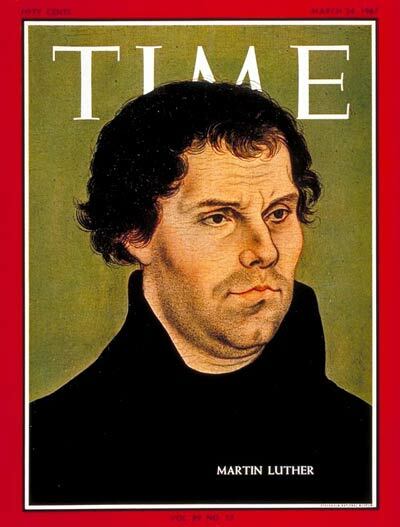 Though we recall him every time we speak our denomination’s name, and though he is credited in many ways with ushering in the modern age, the truth is, Martin Luther wasn’t always considered a force to be reckoned with. He did not seek the life of a world-changing social and religious leader; he intended to live a normal life, to be a lawyer. Instead he entered a monastery, and went on to teach seminary classes on the Bible. He wrote a few challenging documents. But when he was called by the Pope and the Holy Roman Emperor Charles V to defend his writings in the city of Worms in 1521, the Pope’s envoy was certain that no one as uncharismatic and stupid as Luther appeared to be could possibly have written the incendiary and erudite books he was in trouble for writing. He assumed the cowering monk in front of him was an imposter. But this homely, rude mouse was indeed the one that roared. At the conclusion of his hearing in Worms, when he was asked to take back his criticisms of the church, his response concluded with the now-famous line: “My conscience is captive to the Word of God. I cannot and will not recant, for to go against one’s conscience is neither right nor safe. Here I stand, I can do no other. God help me. Amen.” Today we commemorate that brave sentiment and all the work surrounded it, calling it The Reformation of the church, which sounds much more magnificent and innocent than it turned out to be. For the people of 16th century Europe, the sea-change of their world must have been terrifying. The Reformation was not a peaceful religious movement. It spawned class warfare and bloodshed in several countries. People who’d always known what to expect from their church, their governments, and their position in society were suddenly in entirely new territory. Peasants revolted against land-owners while the nobility violently put down such revolts; priests and nuns abandoned their posts; Roman Catholics burned Lutheran preachers at the stake and Lutherans lashed out against priests, church art, and anything that looked remotely Catholic. Besides this religious and social unrest, Europe was dealing collectively with the catastrophic effects of the plague, which wiped out whole villages with infection, not to mention the constant threat of invasion from the Ottoman Empire. In the midst of all chaos, I imagine faithful people everywhere whispering Ps. 46 under their breath: “We will not fear, though the earth should change, though the mountains shake in the heart of the sea, though it waters roar and foam; though the mountains tremble with its tumult.” I imagine some of us are praying that psalm now too. We are reeling from the news of a violent, anti-Semitic attack on a Jewish synagogue in Pennsylvania. And many people are anxious about the coming election in our country, not to mention volatile political movements in other nations, such as today’s election in Brazil. Both Republicans and Democrats have expressed the fear that if the other party wins, it will be disastrous for our state, our nation, and the world. We fear that “the nations” are “in an uproar” and that “the kingdoms” will “totter.” What an awful time for your pastor to leave you! For our own sakes, and for the sake of the world, I’d like to encourage us all to revisit Psalm 46 in the week ahead—maybe even sing Luther’s setting of it as we just did—particularly the last verse: “Were they to take our house, goods, honor, child, or spouse, though life be wrenched away, they cannot win the day. God’s kingdom’s ours forever.” So the Reformation did usher in many important changes, even as it was genuinely traumatic for many people. It’s no wonder today’s political, social, and religious conflicts feel similar. The root problem across the centuries is certainly the same, and Paul expresses it clearly in his letter to the Romans: “All have sinned and fallen short of the glory of God.” It’s not an accident that Luther highlighted this passage often in his ministry. People of every time and every place have always been unable to stop turning away from God, our neighbors, and creation, just when our attention is most needed. We continue to fall short of loving and serving others as we have been served and loved by God. On top of that, we keep forgetting that our ultimate hope rests not in our success at living according to God’s law and our values, but in what appears to be God’s great failure on the cross. The cross looks like the end, but God redeemed that failure (and all failures) by making sure that it was only a new beginning. So we have reason to cling to the words of the angels: “Don’t be afraid.” Remember that the cross is not the end of the story. Though life be wrenched away, they cannot win the day. You and I belong to God. This world belongs to God. Every failure, every political and personal rupture, every gaping wound, is an opportunity for God’s grace to seep in. This is not Luther’s doing, nor the work of the Lutheran church. This is not the work of the Republican party or the Democratic party or the Independent or Green Parties. It is not your doing or mine. Loving, forgiving, saving, and redeeming each one of us and the whole wide world is God’s doing. And in that truth, the truth that God alone can heal and save us, we are set free—free to risk, to dare, to love, to live, to work, to dream, to struggle, and even to fail repeatedly…all in hope. Do not give up. Do not be afraid. God promises to transform all that burdens us. God will bring new life from all the endings, even the cross. Keep the faith, keep the word, keep on trying to reform flawed and failing communities. God will never let go of our hands. I want to conclude with this poem, by Dawna Markovia. This entry was posted in News, Sermons and tagged sermon. Bookmark the permalink.